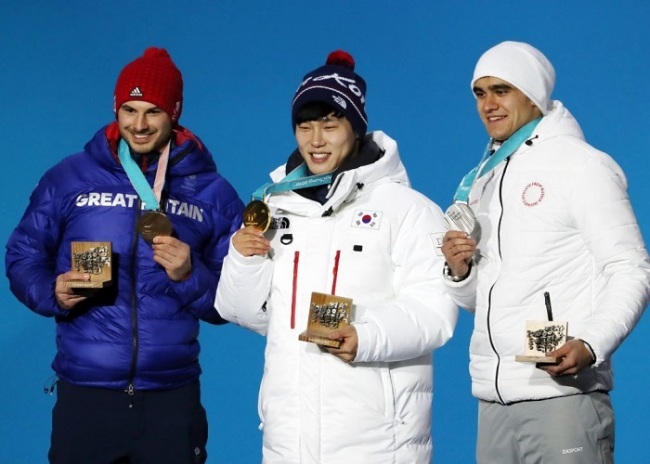 PYEONGCHANG, South Korea -- South Korean skeleton slider Yun Sung-bin said Wednesday when he won his historic gold medal at the PyeongChang Winter Olympic last week, he felt sorry for his idol Martins Dukurs, who failed to stand on the podium after finishing fourth. Yun became the first Asian to win a medal in sledding sports at the Winter Olympics after claiming gold in the men's skeleton last Friday. At Olympic Sliding Center, he was the fastest one to cross the finish line in all four heats, with a combined time of 3 minutes, 20.55 seconds. 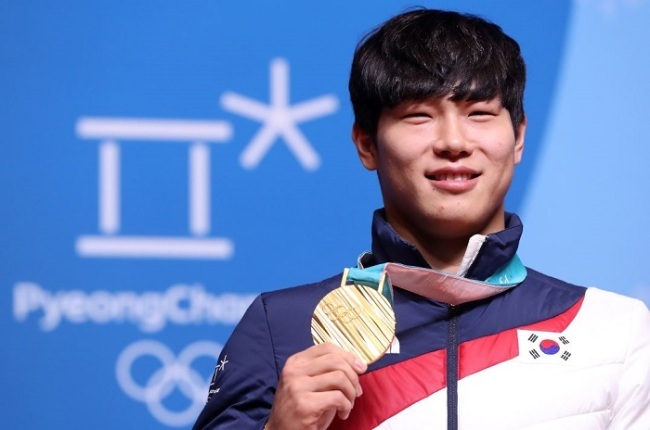 "Obviously, I wanted to win the gold medal, but I also wanted to see Dukurs getting at least a medal," Yun said during his press conference at the Main Press Centre in PyeongChang, Gangwon Province. "I saw his disappointed face in the waiting room, and it made me feel sorry." The Latvian skeleton great Dukurs has been ruling the men's skeleton world for nearly 10 years. The five-time world champion, however, has no gold medals at the Winter Olympics, collecting only two silver. Yun, who ended Dukurs' reign this season by topping the International Bobsleigh and Skeleton Federation rankings and winning the Olympic gold medal, said he later told the 33-year-old Latvian that he is sorry. "I later said to him, 'I'm sorry,' but he told me to enjoy this moment," he said. "He is such as a big-hearted person." Since his gold medal victory, Yun said he hasn't really had time to rest. Nowadays, he's cheering for his bobsleigh teammates. "I try to get sleep when I have break time," he said. "Since our bobsleigh team hasn't finished its competition, I visit the competition venue and cheer for them." Yun has gained international stardom with his historic gold medal and is expected to receive big bonuses for his achievement. When asked whether he has a plan to shoot TV advertisements, he simply said no. "I know many fans are watching me, so I feel that I have earned stardom," he said. "But I'm not an entertainer, so I don't really look forward to appearing in commercials." The 23-year-old South Korean said his next goal is to win the world championships next year in Whistler, Canada. "I've achieved my goal at the Olympics, but no slider has yet to win the world championships in this sport after taking gold at the Winter Olympics," he said. "So, I'll focus on the world championships, and I'm confident that I can do it." Yun said he believes he can compete in the head-first, face-down sliding sport at least 10 more years.